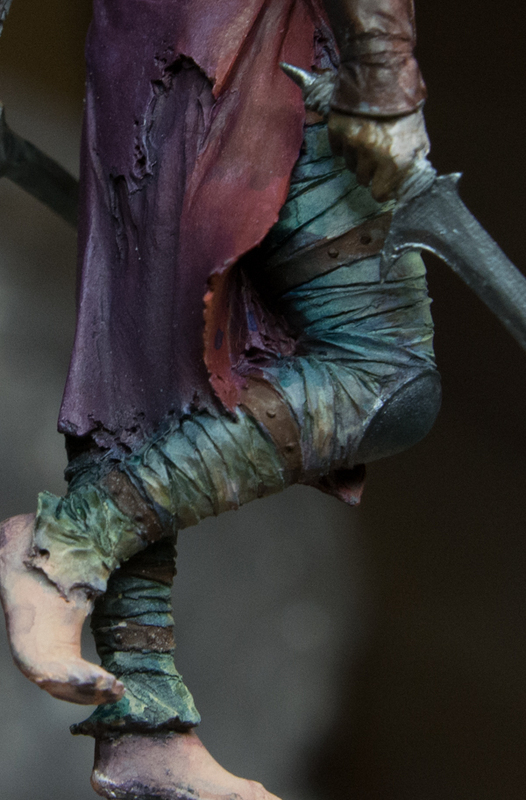 This part of the step by step will be focusing more on the skin areas and the beginning of the cloth around the legs. The base will be covered in a separate step by step. 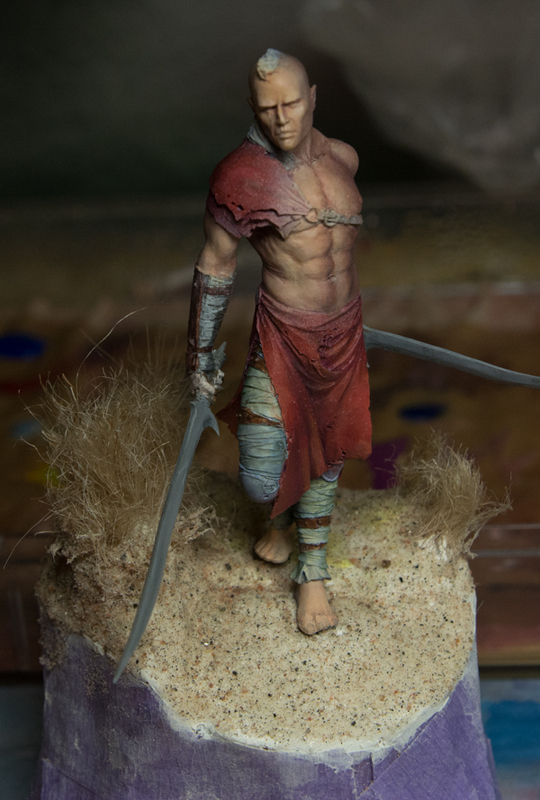 After starting with the skin I realized that in some lights that is not my painting light it looked dull and boring, so I decide to make changes to it. 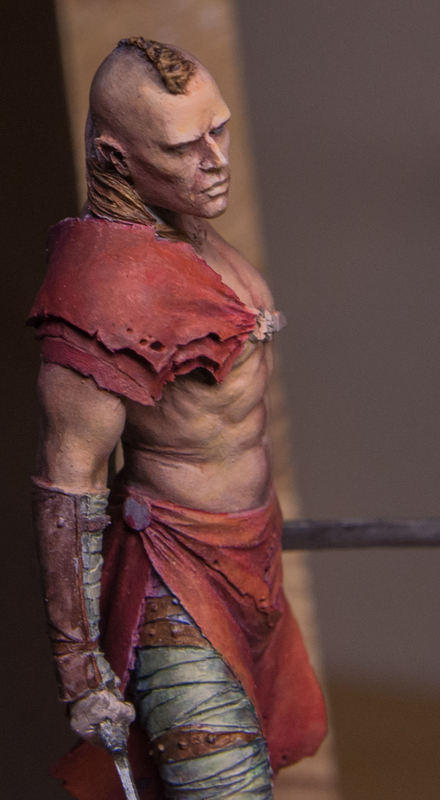 I started to use the airbrush to spray a very light skin color from the direction that the light is coming from. 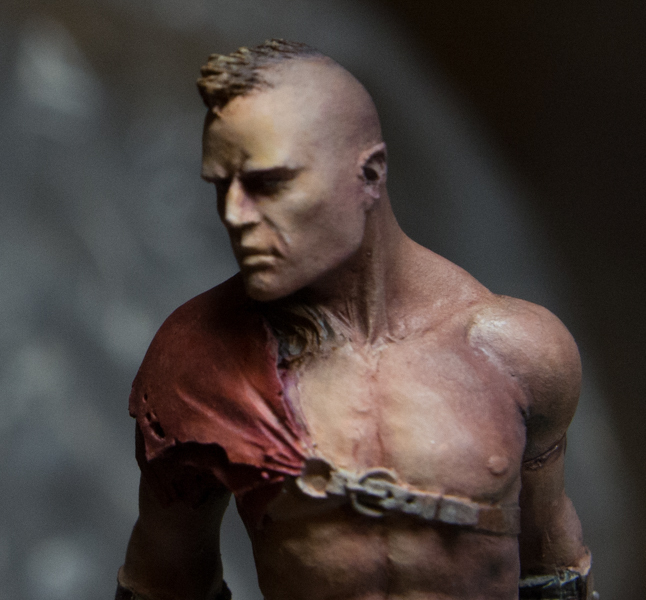 from the frontal side of the figure. Using that mix I then added white, red and yellow to get the different lighter skin tones. 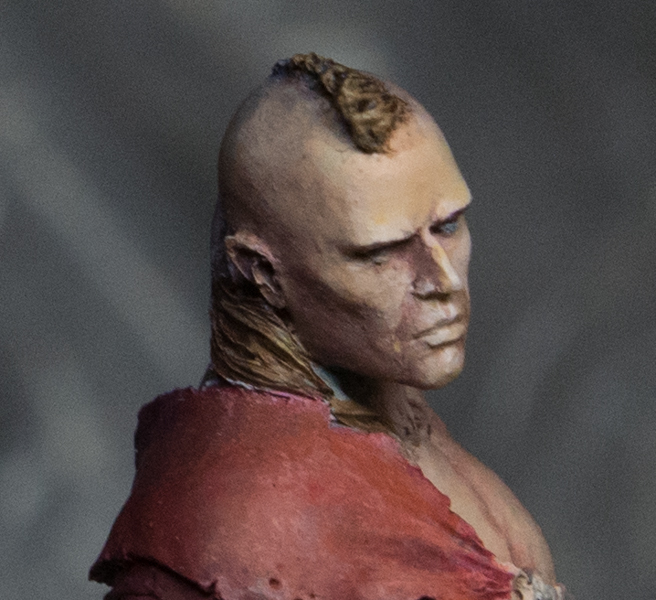 Also brought some more red glazes into the darker frontal skin areas. This has also brought me closer to my original vision to introduced a warmer hue tone into the lighter areas, also the tonal range has been expanded with more reds in the middle areas and that helps the overall feeling. This has brought more life into the skin and it also works in different light situations. It is always good to look at what you are doing from time to time under different light situations to get a feeling how it will look. 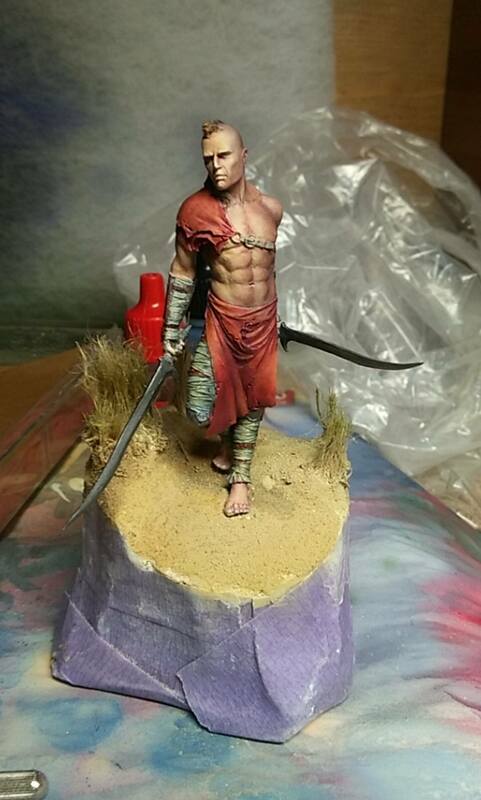 In regards to the red cloth I have added a mix of red and yellow golden colors and used a stronger glaze of orange on some parts of the red to give the feeling of a rising sun that hits parts of the cloth. 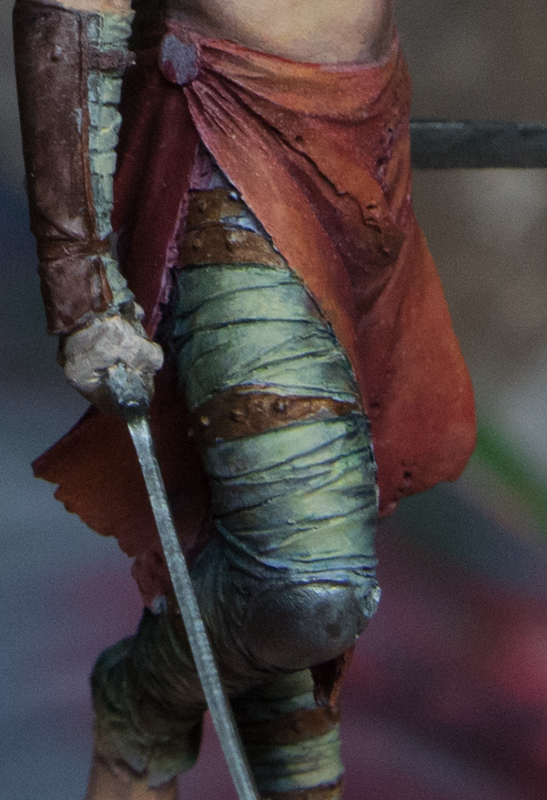 In regards to the leggings I have used a greener tone mixed from the golden colors. 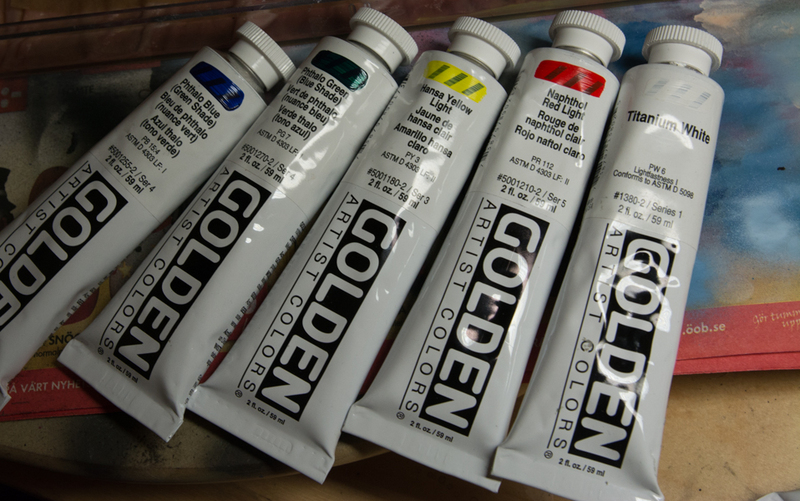 In lighter areas I have used a more yellowish green. In the shadows I have added more of the blue and on the backside it is almost going to a darker purple kind of color. I have also added some small areas with red glazes. this is still very much a work in progress area. I also stared the hair part to frame the face more and get a better overall feeling of that area. The face area I have started to work on some of the details at the same time I started to work on the hair to define it more. Will go back later then I am getting to finish my model to make the last changes to make it harmonize with the rest. 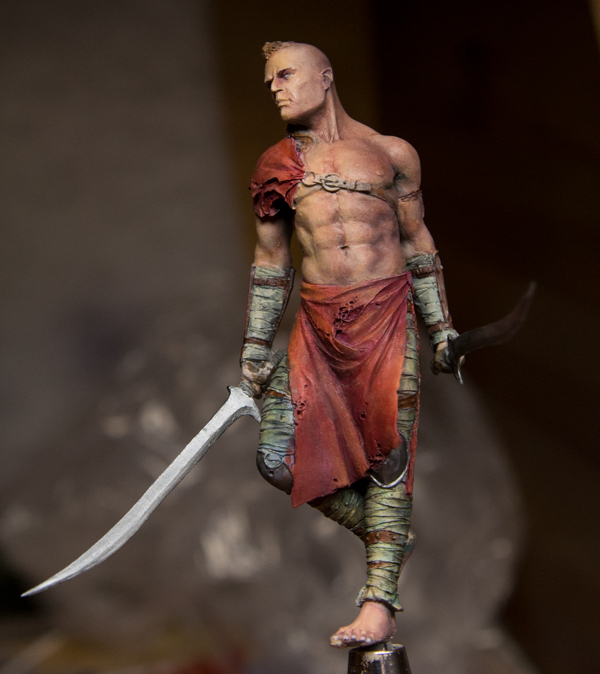 As said before next step is to start on the base to fit it into the same feeling and then go back to the figure again. I have realized that I like to jump around while painting and not doing the same area for a long long time. Also I seem to not touch some areas, like the feet at the moment just have a basic skin color. but I do want to see how the base turns out and get the felling later on that they belong together and the figure “belongs” to the base. If anyone out there have any suggestions or thoughts regarding my work you are welcomed to give comments. It can be both regarding my writing or the result of the painting. I am after all doing this to improve myself and inspire others.